Some friends of mine brought this back for me - it's another place I haven't been, but will totally go when I finally do my roadtrip up to Buffalo. Oh, I know, who actually has a roadtrip to Buffalo planned? Me. At some point. You know what I love? Learning new things. I always remember learning something cool and running home to tell my parents, like it was something that no one else knew before. Whether it was how to use an apostrophe (yes, that story has to be another magnet all together) or that the earth was 70% water, or whatever. 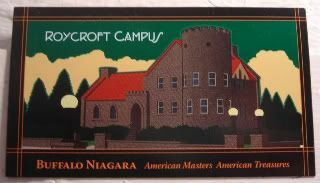 So, it's with great anticipation that I'll eventually learn about the Roycroft Campus, and what they're calling a "significant cultural movement that influenced" ...that I've never heard about until this magnet. From what I can tell, it's basically the arts & crafts preservation movement that happened in response to the mechanization and mass production of well, arts & crafts. The Roycrofters were apparently in favor of the individual artisans - indeed, the campus became the place for those artisans, authors, and philosophers to get together. Nowadays, it's a National Historic Landmark, with more than a dozen structures included, and you can still visit and take classes in bookmaking/binding and letter typesetting, or metalsmithing or screenprinting, or other activities like watercolors or stained glass. At the very least, worth a visit!